Not only is the HERO3+ Silver Edition 15% smaller and lighter than previous models, it’s 2x more powerful—making it the most advanced Silver Edition camera yet. Wearable, gear-mountable and waterproof to 131’/40m, it captures professional-quality video at resolutions up to 1080p60 and 10MP photos at up to 10 frames per second. With faster built-in Wi-Fi, enhanced low-light performance and 30% longer battery life, the HERO3+ Silver Edition makes capturing and sharing your life easier than ever. Smallest, lightest Silver Edition yet. The HERO3+ Silver Edition is 15% smaller and lighter than previous models—making it the most mountable, wearable and versatile Silver Edition GoPro yet. Boasting 2x the performance of its predecessor, the HERO3+ Silver Edition captures high-quality 1080p60 and 720p120 video and offers dramatically improved low-light performance. Featuring a 30% increase in battery life, you can go longer and capture more with the HERO3+ Silver Edition. 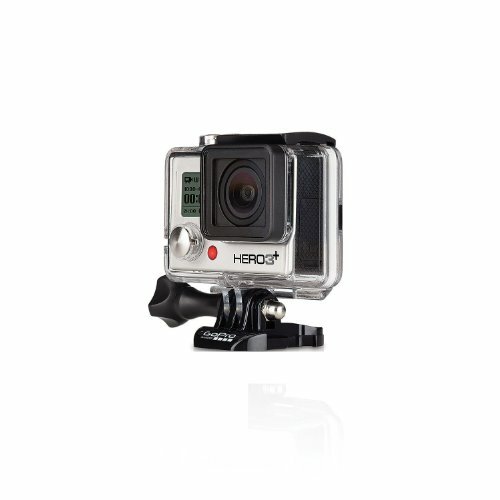 Stunning video quality has made GoPro the world’s best-selling camera company, and the HERO3+ Silver Edition continues this tradition. High-resolution, high-frame rate 1080p60, 960p60 and 720p120 video modes result in professional quality footage and allow for liquid-smooth slow motion playback. The HERO3+ Silver Edition captures gorgeous 10MP stills at up to 10 frames per second—perfect for fast-action sequences. Time Lapse mode lets you capture a series of photos at 0.5, 1, 2, 5, 10, 30 or 60 second intervals. Thanks to a vastly upgraded sensor, the HERO3+ Silver Edition delivers remarkable low-light performance and overall enhanced image quality. Enjoy crisper, clearer footage with reduced distortion. 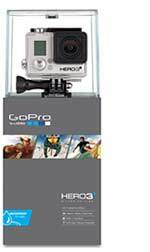 The HERO3+ Silver Edition boasts increased image sharpness and a 3x reduction in imaging artifacts. Sound quality is as important as image quality. The HERO3+ Silver Edition features upgraded audio performance, capturing even the most subtle of sounds—whether you’re recording voices, music or the roar of your engine on a spirited drive. Advanced wind-noise reduction technology keeps the audio clearer during high-speed activities. Speedier Wi-Fi delivers 4x faster² video preview and faster photo and video sharing with the GoPro App than ever before. Also enjoy enhanced connectivity to the included Wi-Fi Remote, which enables control of up to 50 cameras from distances of up to 600’/180m. ¹Compatibility varies by device. Video playback and sharing is compatible with videos captured in select modes only. ³Content playback, sharing and access to the camera’s memory card is not available on Windows Phone. ⁴Based on GoPro engineering testing. Actual performance may vary based on settings, environmental conditions and other factors. Maximum battery capacity will normally decrease with time and use.